Contains natural extracts of 2 types of medicinal mushrooms: 80% of Lingzhi cracked spores and 20% of Yunzhi concentrated extract. Heritage® Lingzhi Crack-Spores Plus is an all-round health supplement which is able to boost your immune system, counter fatigue and stress and support a healthy circulatory system. - Relieves stress, improves sleep and increases concentration power. - Strengthens the heart and improves general circulation. 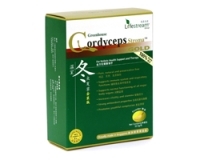 - Supports healthy liver and kidney functions, improves digestive functions. - Relieves aches and pain of the joints in the elderly. 80% of Lingzhi Spores (Reishii mushroom) and 20% of Yunzhi (Polysaccharide-peptide). 1 to 2 capsules to be taken daily with warm water. Heritage Lingzhi Cracked-Spores Plus is manufactured in Singapore according to stringent cGMP protocols and, is registered and approved by Health Sciences Authority, Singapore.